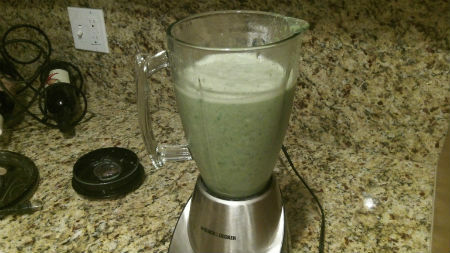 This smoothie is great for anyone who enjoys tropical drinks and would like to give them a healthy twist. Personally I find most tropical drinks overly sweet and found the crisp tartness added by the greens to be pleasant and enjoyable. Fill to the top with the plant milk of your choice, and then blend on high speed until completely liquified. When you’re finished it will have a vibrant green color, and should taste delicious. 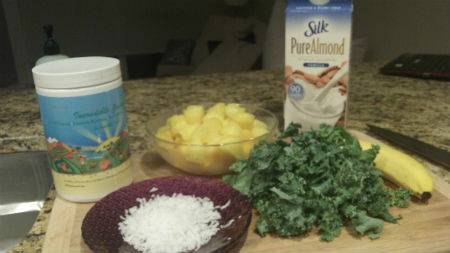 The addition of Kale makes the drink a little bitter, but I think it makes the drink refreshing, and the taste of the pineapple, coconut, mango and banana ensures it has that distinct tropical flavor. 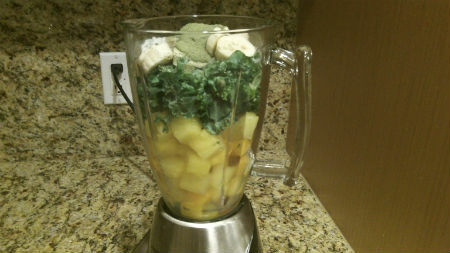 The addition of Incredible Greens ensures additional nutrients, and I can definitely taste it in the drink. It has a distinct after taste in smoothies that I enjoy, but might take a little getting used to for people new to green drinks. 5+ servings of vegetables in one 8 ounce drink. I made this yesterday and enjoyed a nice sustained energy boost throughout the day. If you’d like to experience the same then I highly recommend you try it yourself!